Action Lab Entertainment’s Aberrant, a new high-octane action comic book series from screenwriter Rylend Grant – featuring art from Zsombor Huzska, Davi Leon Dias, Iwan Joko Triyono, and HdE – will be developed for television by 24 and Felicity producer Tony Krantz via his Flame Ventures banner. Grant, a two-time blacklister, will write the script and executive produces alongside Krantz. Ryan Colucci and Rising Spirit Films – who financed the comic – will also be involved. Grant has of late penned screenplays for Justin Lin and F. Gary Gray. Krantz most recently produced NBC’s Dracula and Blood & Oil for ABC. His latest TV endeavor, Wu Assassins, will premiere on Netflix next year. 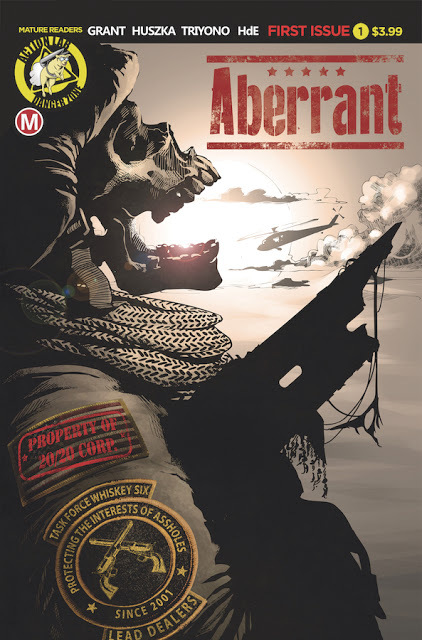 Aberrant follows David Colbrenner, a U.S. Army Special Operations Commander, who after losing his entire unit to a superhuman attack, wages an absolutely brutal one-man war on the eccentric billionaire and former superhero, Lance Cordrey, whom he believes is ultimately responsible. That is until Nelson Little, the head of a clandestine paramilitary outfit called Article 13, provides David with evidence that Cordrey may be a patsy, and David’s men were killed as part of a vast and twisted government/military conspiracy. Grant describes Aberrant as a modern political/conspiracy thriller in the vein of Michael Clayton or Enemy of the State that explores how the United States’ military and geopolitical agenda would necessarily change if superpowered individuals (the “Aberrant”) walked among us. He likes to refer to his book as the karmic cousin of groundbreaking 70’s mind benders like The Conversation and Marathon Man. Interestingly, Aberrant was perhaps the last major comic series created inside Los Angeles pop culture bastion Meltdown Comics. The geekdom landmark sadly just announced it would be closing its doors after 25 trendsetting years.